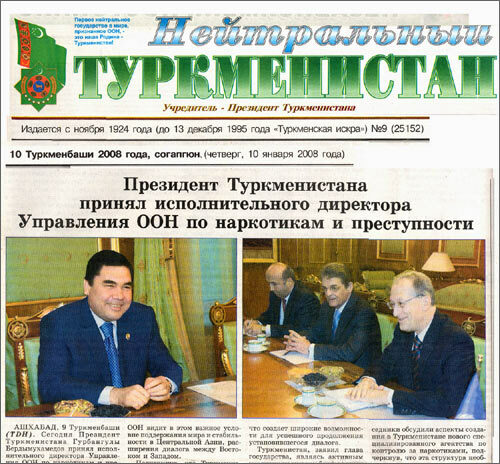 President of Turkmenistan Gurbankuly Berdymuhammedov congratulated the State Drug Enforcement Service on its first anniversary on January 18. "The work you've done provided peace in the country and serenity of the population. It reinforced unity and solidarity, it strengthened foundations of healthy society," his message stated. Turkmenistan combats drug trafficking within the national program of drug enforcement and aid to drug-addicts adopted for 2006-2010. Fighting this evil, Turkmen services pool efforts with foreign countries and international organizations like the UN, OSCE, and others. Unfortunately, intensiveness of trafficking and the number of addicts in the country refuse to lessen. Drugs are openly sold in Turkmen cities and villages. Their ready availability is recognized as a threat to the gene pool. Hence establishment of the State Drug Enforcement Service a year ago, a structure coordinating efforts of the national systems of health care and education, general public, local authorities, law enforcement agencies, and the army to eradicate this evil. As a matter of fact, the Turkmen authorities did not really have a choice. Before establishment of the State Drug Enforcement Service, trafficking in the country was fought autonomously by the Interior Ministry and National Security Ministry. Customs officials, border guards, law enforcement agencies, and security structures also contributed. But since everybody's business is nobody's business, there was really nothing to show for the separated efforts. Dope continued its unchecked march, spreading into all strata of society and even into the structures that were supposed to fight its proliferation. The State Drug Enforcement Service began with gusto. Junkies and pushers were arrested all over the country. Even some untouchables were detained, major drug dealers enjoying protection by senior officers of the Prosecutor General's Office, Interior Ministry, and National Security Ministry. All the same, the problem is so serious that even the special anti-trafficking service itself either recognizes its own helplessness or ends up on the criminals' payroll. Everything comes down to the absolute lack of glasnost. All data, all facts, and all figures on the subject are a state secret guarded so jealously that not even the presidential message is an indication of effectiveness of the struggle with drugs. No hard facts, just lyrics - "the work you've done", "invigorate the struggle", "enlist services of general public"... Nothing on the number of addicts arrested in Tajikistan or smugglers on the Tajik-Afghani border. Nothing on mules or pushers detained, nothing on joints shut down. Independent analysts studying the problem are convinced that drugs remain an undefeated evil in Turkmenistan because some of the state structures mentioned above offers protection to smuggling and some other controls domestic distribution. Special anti-trafficking service notwithstanding, drugs remain an easily available commodity. One Ashir aga of the settlement of Kunjaurgench told this correspondent a story of his neighbor who had made a fortune selling drugs. The man had a posh mansion built, outfitted it with the latest home appliances, and bought himself a Toyota of the latest make. "Everyone knows that he deals in drugs and sells this poison right in his native settlement. There is absolutely nothing to be done about it," Ashir aga said. Ashir aga mentioned autos with state license plates regularly idling near the neighbor's mansion, and autos of the local prosecutor and police chief whose drivers do not even stop the engine when they drop in for a minute or so. "We take pride in the bold and determined war on drugs the State Drug Enforcement Service is waging," Berdymuhammedov's message stated. Boldness and determination in dealing with this evil all over the civilized world imply openness, ultimatism, and consistency. In Turkmenistan, not one of these standards is met. The Turkmens have never shaken hands with the people selling poison to others and making fortunes on misfortune of others. In the past, the Turkmens went out of their way to expose these people. These days, the Turkmen authorities play mum's the words even after successful operations against mules and pushers. Experts say that this practice does not really solve the problem but drives it deeper. Cultivation of poppy in Turkmenistan itself is outlawed. All attempts to defy the ban and cultivate hemp or poppy are thwarted in the course of special operations run every year. There are no laboratories in Turkmenistan where raw opium is processed into heroin. All dope is smuggled from nearby countries and first and foremost from Afghanistan and Iran. There are lots of holes on the Turkmen borders with these countries and smugglers know them all. Unfortunately, this state of affairs is never publicly acknowledged. The state border was properly protected in the Soviet past and drug-addicts in all of Soviet Turkmenistan could be easily counted on one hand. These days, there are over 100 officially recognized and registered addicts in the Khankhovuz etrap or district of the Mary velajat (region) with the population standing at only 2,000. Nobody knows exact figures for the district, region, or the country. Only Allah probably does.